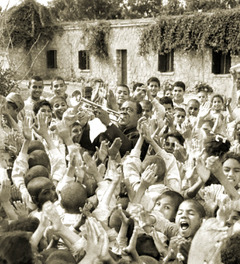 Louis Armstrong entertains children at the Tahhseen Al-Sahha Medical Center in Cairo, Egypt, 1961. The United Nations designates April 30 as International Jazz Day in order to highlight jazz and its diplomatic role of uniting people in all corners of the globe. The U.S. has used jazz in diplomacy since the 1950s, when the U.S. Information Agency created the Jazz Ambassadors program to send leading American Jazz musicians such as Louis Armstrong, Dizzy Gillespie, Benny Goodman, and Duke Ellington to perform overseas. An exhibit commemorating this program, created by Meridian International Center, is now on view at the U.S. Diplomacy Center in Washington, DC.